Great netbook for regular office and everyday use. Elegant design and really portable. It's also incredibly fast compared to the other netbooks available in the market (thanks to the fast Atom processor coupled with the 2GB RAM). It took me no significant time to boot it up which I think is really sweet. It's also a good buy. 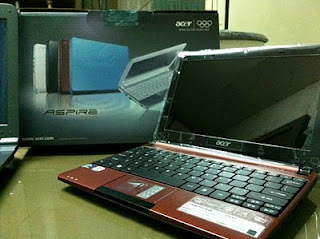 Here in Cagayan de Oro City, I bought it at AcroTech in Limketkai Mall for only Php18,500. That came with a free Acer external Optical Drive, a genuine Windows 7 Starter and a 1 year warranty. Been testing it out and I think it's really worth buying. I recommend this to those who are seeking for an ultra portable and not so expensive netbook that is good for traveling and the usual office use. This maroon model looks really classy too.